Based in Portland, Ore., Christine Binnendyk has written about health topics since 2001. She is the author of the book "Ageless Pilates" and her work has appeared in "SELF" magazine and "Pilates Pro." Binnendyk holds a Bachelor of Arts in journalism from the University of Connecticut and certifications from YogaFit, ACE, IDEA, Oregon School of Massage and the Pilates Studio of New York. Vodka is considered hard liquor, a popular term for whiskey, tequila, rum, gin, vodka, and other distilled spirits. The "proof" is the percentage of alcohol in the liquor. Vodka labeled 80 proof contains 40 percent alcohol, while 100-proof vodka contains 50 percent alcohol. To estimate the caloric content of hard liquid, all you have to do is multiply the number of ounces by the proof and then by .8. Keep in mind that there are roughly 30 milliliters in 1 ounce. A 50-milliliter "nip" bottle is slightly larger than a standard 1.5-ounce jigger or shot. A nip bottle of 80-proof vodka contains about 97 calories, while a 100-proof nip bottle offers about 124 calories. A liquor pint is 375 milliliters, about three-quarters of a standard pint. A pint bottle of 80-proof vodka contains about 809 calories, while a 100-proof pint bottle offers about 1,033 calories. A fifth refers to a fifth of a gallon, or double the size of a pint. 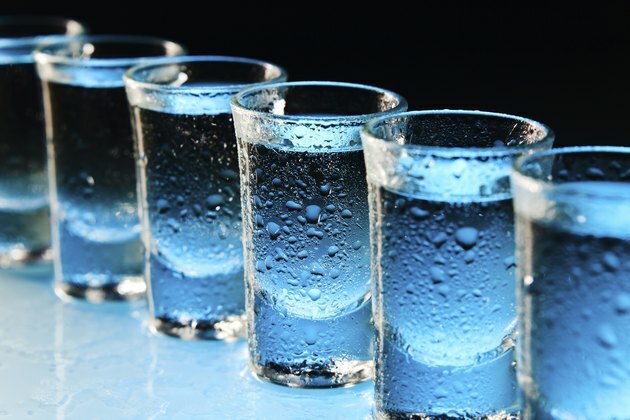 A fifth of 80-proof vodka contains about 1,618 calories, while a fifth bottle of 100-proof vodka offers about 2,066 calories. Rethinking Drinking: What’s a Standard Drink? How Many Calories in Svedka Vodka?